These are so toddler friendly, Miss 2 loved them! Optional: Chilli flakes, fresh coriander. Allergy: soy free, dairy free, gluten free, egg free, peanut free, tree nut free. Mix the marinade together and place the chicken tenderloins in it. Refridgerate for 1-2 hours. Note: Using a pyrex dish is ideal as it can go from marinading to the oven. Place in a preheated oven and cook at 180’C for 30 mins. Flip the tenderloins halfway through and check periodically to see if they need basting. (Alternatively, you can pan fry these). Once the chicken is cooked and still moist, grill briefly to brown. After removing the chicken, add a little cornflour and whisk to create a dipping sauce. This creates amazing melting-off-the-bone roast chicken with crispy skin and fantastic gravy. For best results (and practicality) it uses both a slow cooker and a oven. (The alternative is 5 hours in the oven but then you won’t get the amazing corn!). Vegetables to roast (i.e. potatoes, zucchini, carrot, whole peeled garlic, corn-on-the-cob). Allergy friendly: soy free, dairy free, gluten free, peanut free, tree nut free. Tip: Whole peeled garlic is often sold in large bags; consider portioning it out into little bags and freezing it. You can pull it out of the freezer each time you have a roast. Mix the spice blend together. Peel the onion & top’n’tail it. Make sure the chicken is ready for cooking (i.e. giblets removed). Rinse the cavity and pat dry with a paper towel. Rub the spice blend over the chicken inside and out. Put the onion inside the chicken cavity. 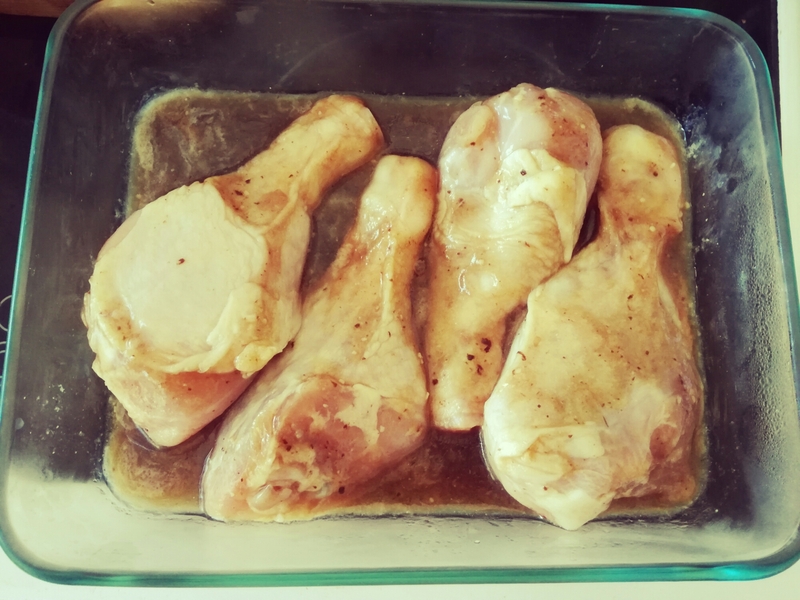 A note on timing: You can rub the chicken the night before, wrap it in a plastic bag, and marinade it overnight in the fridge so that all you have to do in the morning is pop it in the slow cooker. The choice on whether to put the cooker on Low or High depends on how long it will be in there and how long you want to have it in the oven. My chicken wasn’t 100% defrosted so I had it on High in the slow cooker for 5 hours and then in the oven for 1.5 hours. Prepare your vegetables to roast. I chop the potatoes up and put them in the steamer in the microwave for about 10 minutes to give them a bit of a head start before placing them in the roasting pan. You can brush the veggies lightly with oil before placing the chicken on top – they just need a touch to keep from drying out before the fat from the chicken starts to drip out. Carefully pull the chicken out of the slow cooker and put it in the roasting pan. Baste it with the juices from the slow cooker. Roast the chicken for 60-90 mins. Start the oven at 180-200’C; you’ll be able to drop the temperature to 150’C and cover the chicken in tin foil once it has browned. Keep basting the chicken periodically with juices from the slow cooker. Put the corn-on-the-cob in the slow cooker (in the chicken juices) as soon as you take the chicken out. Cook on High for 60-90 minutes. The juices will only cover the bottom of the corn; this is fine. It comes out cooked, still with a good steamed firmness, sweet, and lightly flavoured by the chicken broth. Once the chicken, roast veggies, and corn are all cooked, you can use the juices in the slow cooker to make gravy. You can use flour or cornstarch, or try potato flakes. It’s not just that these are gluten free, it’s that they thicken the gravy quickly and don’t go lumpy like cornflour sometimes does. Add potato flakes gradually (leaving the slow cooker on) and stirring; I made my gravy quite thick. Leftover roast chicken can be used for the next night, sandwiches, to make chicken fried rice, or as a pizza topping on a flat or scone base. 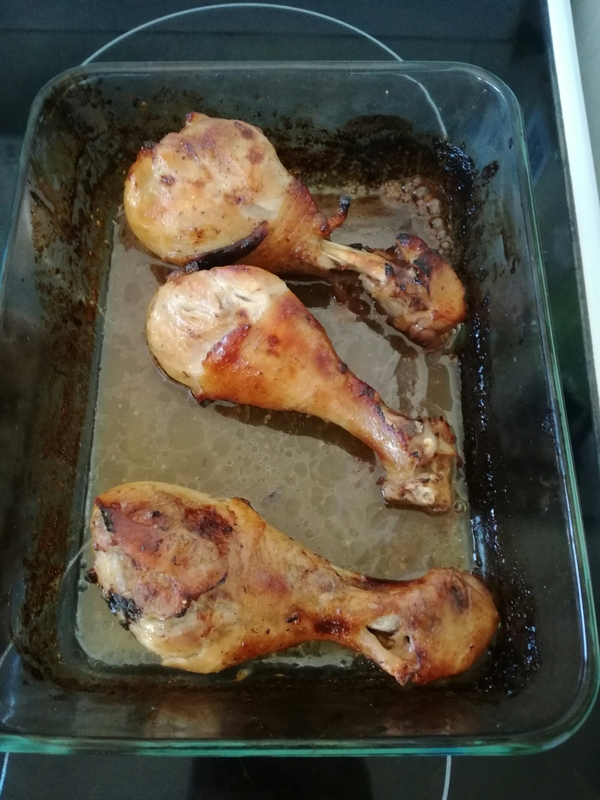 Chicken drumsticks can be cheap to buy and child friendly (after all they have a built in handle!). They can also be easily picked of meat to make into other dishes which means that you can cook a big batch of chicken drumsticks then use them as the basis of several dishes over the next few days (or freeze the meat for later use). I had a pack of ten all frozen together so decided to try two new marinades: Sweet & Spicy Marinade and Caramelized Balsamic Marinade (my preference). I used the drumsticks to make: Chicken drumsticks with rice, corn on the cob, and smashed avocado; Shredded chicken with rice, peanut sauce, and fresh rocket from the garden; Chicken Fried Rice -(just add cooked chicken to the linked recipe); Sweet & Spicy Chicken Noodle Soup; a mini chicken pizza with home-made base, and chicken sandwiches. Allergies: soy free, gluten free, egg free, dairy free, nut free. I suggest marinading. This might be anywhere from an hour to all day (I mixed up the marinade at breakfast, fridged them, and cooked them for dinner). Bake the chicken drumsticks till the juices run clear and they are cooked to the bone; this can take about 1 hr 1/4 (75 mins). Boneless chicken thighs spread flat will cook much quicker, about 30-40 mins. Check on the chicken regularly to baste and turn every so often. The depth of the marinade will be determined by how much chicken you’re cooking and what kind of tray or dish you’re using. You can see from the photos that I crammed mine into a glass pyrex dish which kept the marinade high and the drumsticks moist. About halfway through cooking drain off any excess marinade and retain just enough to keep basting. Once the chicken is cooked you may want to change the oven to grill. Keep a careful eye on it (you don’t want the chicken to burn or dry out) and you can get a good colour on both sides. The marinade should have cooked to a caramelized glaze. Allergy: soy free, dairy free, egg free, peanut free. This is a great way of using up the leftover marinade from cooking Sweet & Spicy Marinated Chicken Drumsticks to make lunch for the next day. This is a laksa style dish so the noodles are the main component with the broth flavouring them (you’ll eat some of the broth slurping the noodles but most of it can be discarded when you’re done). Cooked chicken (shredded from the cooked drumsticks). If you’re planning to make the soup then add quartered mushrooms into the marinade when cooking the drumsticks. About 40-50 minutes into cooking the drumsticks, tip most of the marinade (including all the mushrooms) into a large noodle bowl (or pot) to make lunch for the following day. Heat the marinade to piping hot (in the microwave or on the stove) to make sure that the chicken juices are thoroughly cooked. Dilute the marinade with chicken stock. The amount will depend on how much marinade you have and how many people you’re making this for. You’re making this to taste so try adding a 1/2c at a time. The marinade is a bit sweet so you want to balance this for the noodle broth. Add a dash of fish sauce, lime juice (or lemon if you don’t have lime), and chilli powder to taste. 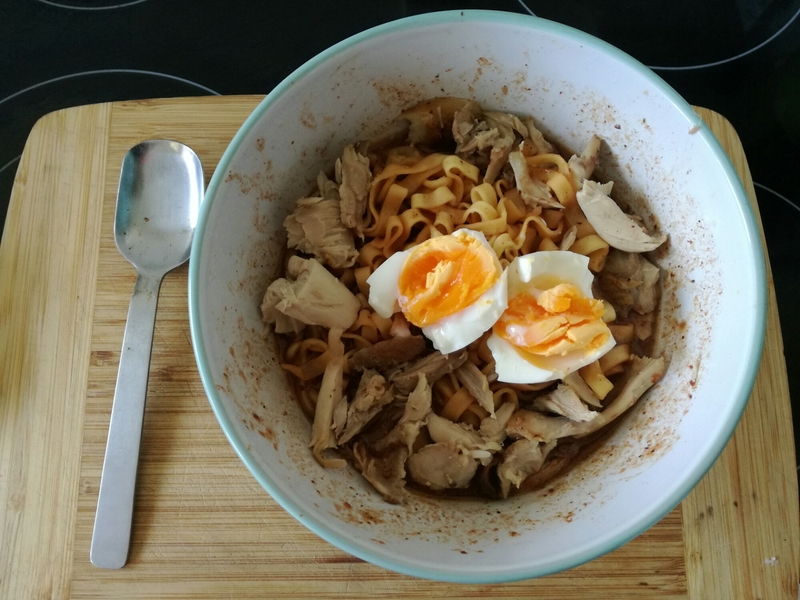 When serving for lunch the next day, cook dry egg noodles in the broth. Also add cooked chicken from the previous night’s chicken drumsticks. (If cooking for one then you can basically microwave it all in a large noodle bowl). Garnish with a sliced hard-boiled egg. You may also want to add sliced long green beans or sliced spring onion.